The 2nd Parachute Battalion began to form in the autumn of 1941, with the aim of reaching operational readiness in the summer of 1942. However, it had barely completed parachute training when in January 1942 C Company, led by Major John Frost, was chosen for a special mission proposed by Admiral Lord Mountbatten, Chief of Combined Operations. The target was the Wurzburg precision radar dish, one of a series of early-warning installations on the north coast of France. This particular radar dish was situated close to an isolated cliff top chateau near the French coastal village of Bruneval, north of Le Havre. The objective was not to destroy the dish but to dismantle it and return to England with as many of its vital parts as possible. 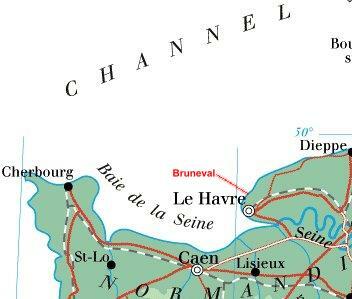 It was a task which could be accomplished only by airborne troops, as Bruneval's steep cliffs and a string of machine-gun posts ruled out a direct beach assault. OPERATION BITING was mounted on the night of 27 February. The raid was a complete surprise. However, the sappers of 1st Parachute Field Engineers under Captain Dennis Vernon, with Flight Sergeant Cox, a radar specialist, had very little time to dismantle, photograph and sketch the Wurzburg radar before Major Frost ordered a withdrawal to the beach. After an alarming day, they were taken off by landing craft of the Royal Navy. The operation was a complete success. 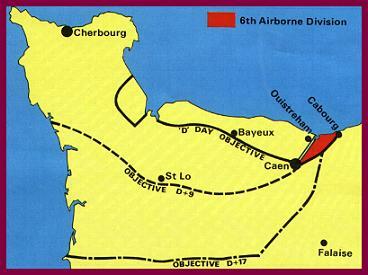 The 6th Airborne Division's task on and after 'D' Day, 6 June was to secure the eastern flank (right of Sword) of the Allied landings which were to take place on the beaches of Normandy. This flank had to be held as it would eventually be the hinge on which the Allied armies would pivot as they broke out of the bridgehead to sweep on to Paris, Brussels and the Rhine. The objectives for the 6th Airborne Division were the high ground east of the River Orne which over-looked the beach-head and the seizure, intact, of the bridges of the Caen Canal and the River Orne, the destruction of the five bridges in the flooded valley of the River Dives some seven kilometres beyond the high ground, and finally the silencing of the strongly fortified, major coastal defence battery at Franceville Plage - the Merville Battery. Although the night drop was accomplished in less than ideal conditions and the troops were widely scattered, all the divisional objectives were achieved. The Germans quickly mounted counter-attacks against the entire beach-head, in particular, on the vital ground held by the 6th Airborne Division. Heavy fighting continued for some weeks. When the counter-attacks were finally stopped the airborne troops held their positions by vigorous patrolling actions. On 17 August the 6th Airborne Division advanced eastwards, overcoming German resistance at Cabourg, Dozule, Putot-en-Ange and Pont L'Eveque and on 26 August they reached the Seine. In this hard-fought but successful operation, the 6th Airborne Division suffered the loss of 1166 men, either killed or missing. After the fighting in Italy the 2nd Independent Parachute Brigade underwent training at Salerno before receiving orders to drop into southern France. 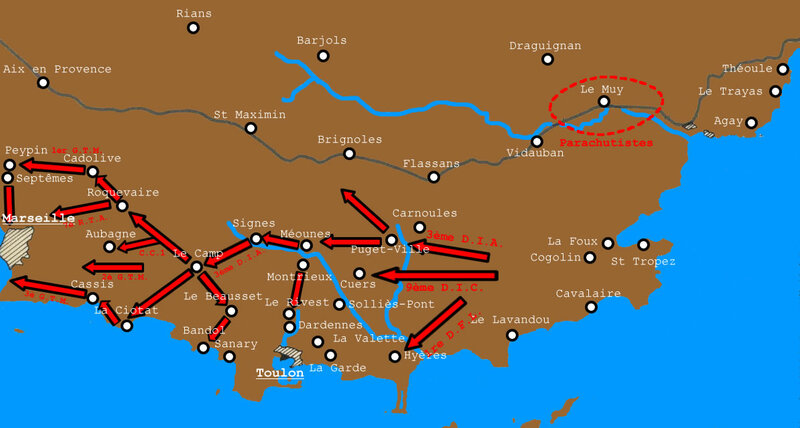 On 15 August, the Brigade dropped at dawn around the village of Le Muy. They helped take this important position astride the supply line to the German coastal forces, making it possible for the landing and rapid advance of the US Seventh Army. Having taken all their objectives and linked up with the ground forces, the Brigade returned to Italy on 26 August to prepare for their next operation in Greece. Arnhem, from the British Airborne perspective, is extensively covered within the Operations 1941 to 1945 Section. In December 1944, the German armies launched a massive counter-attack through the forests of the Ardennes. The plan was to drive across the River Meuse and on to Antwerp to split the Allied armies and their lines of communication. The 6th Airborne Division, rested and re-trained after their success in Normandy, were ordered over Christmas to move at once by sea and road to take up defensive positions between Dinant and Namur in order to defend the crossings of the River Meuse. By the time the 3rd and 5th Parachute Brigades were in position, the German advance had been brought to a halt. Just before New Year's Day 1945, the brigades were ordered to advance against the tip of the German salient. 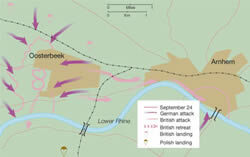 The German Army, however, was still full of fight and it became necessary to attack. On 3 January, 13 PARA was ordered to attack the village of Bure which was strongly held by the Germans. After some very heavy hand to hand fighting, the battalion forced the Germans to withdraw but at a cost of heavy casualties. In January the division withdrew to Holland and carried out active patrolling along the River Meuse before returning to the UK in late February. The final barrier to Germany had been reached by March 1945 and on the 24th, the 6th Airborne Division, together with the US 17th Airborne Division, dropped in the Wesel area to secure and deepen the 21st Army Group bridgehead east of the River Rhine. 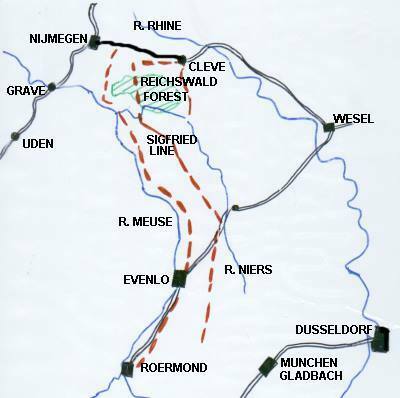 Once landed, the division's objectives were to occupy the high ground of the Diersfordter Wald, the village of Hamminkeln and certain bridges over the River Issel. The 3rd and 5th Parachute Brigades landed first, followed closely by the gliders of 6 Airlanding Brigade and Divisional troops. The division landed as a complete force on its objectives, avoiding the mistakes of Arnhem. Due to heavy anti-aircraft fire and dust and haze on the landing zones, the glider pilots lost visibility and consequently there were heavy casualties on landing. In this, the most successful and final major airborne operation of the war, all objectives and link-up with the ground forces were achieved within 24 hours. Thereafter, between 26 March and 2 May, the division advanced 350 miles, mostly on foot, to the Baltic coast where they met the advance elements of the Russian forces at Wismar.